Trent Grimsey's Blog: September 2012 - English Channel World Record! September 2012 - English Channel World Record! Wow - what an absolute whirl wind the past two weeks have been. I'll try and start from the begining... I arrived in London late at night on the 27th of August with my coach Harley Connolly. I'd just competed in a different marathon every weekend for the past 6 weeks so I wasn't feeling too crash hot. When we arrived we picked up our hire car and drove to our first hotel in Folkestone. We arrived at around 11pm so as soon as we got to our room we crashed straight away. It wasn't until the morning when he woke up that we discovered just how dodgy our hotel was. The room was tiny and I could hardley even fit my bag in there - there was no shower so we had to take baths all week and the beds must have been about as old as the run down hotel. As disappointing as it was we tried to stay positive because we were only going to be there for about a week before switching to the Varne Ridge Holiday Park. I had been told before coming over from a friend and fellow channel swimmer that the best place to stay over there was the Varne Ridge. It didn't disappoint. David and his wife Evelyn who own the place were great they did everything they could to make us feel welcome. All the people that stay at the Varne Ridge are channel swimmers, so it was cool just to walk around talking to the other swimmers and finding out their story and why they wanted to swim the channel. It was like one big family, everyone was so supportive of each other. Pretty much everyday I was there before I actually swam the channel was exactly the same. Wake up in the morning have breakfast, go training﻿, rest, have lunch, rest, go training again, then have dinner... It was very repetitive and boring but that's what we needed to do to swim fast. I swam at the Dover pool for most sessions and the lifeguards there were great. When they saw me come in they'd clear a lane for me so I'd always have a lane to myself. The other public swimmers were also great they all knew I was going for a record attempt so they didn't have a problem with me having a lane to myself. Some days in the lanes either side of me there would be up to 6 people in each lane. I did train in the Harbour at least once every three or four days to get my body ready to the cold water, but I much perferred to train in the pool. The first day I swam in the Harbor nobody else was in there and I was too scared to swim too far by myself so I just decided to swim about 100m back and forth very close to shore for about 45 minutes. I absolutely hate swimming in an ocean by myself. It was very weird that no one else was in the Harbor at that time because there are normally other channel swimmers in there all the time. The next time we swam in the Harbour I made my coach Harley hire a kayak and paddle next to me. Thankfully the third time I swam in there my support swimmer Damian Blaum had arrived by then and it was much better having someone else to swim with out there. Damian arrived in on the 5th of September. For anyone that doesn't know Damian has been one of the best marathon swimmers in the world over the last 10 years now. He finished second to me this year in the 2012 Fina Grand Prix ranking. I was very lucky have him there helping me out! It was on Thursday the 6th of September when I was half way through one of my training session when I got the call from my pilot Mike Oram saying he wanted to meet up to discuss when we should plan to swim. We met up an hour later on his boat down in the harbor. He gave us all the information he had on what the weather conditions were going to be like that week and we decided that Saturday morning at 5am would be the best time to swim... I had been dreaming of this day for so long and now it was going to finally be happening. That night I didn't get much sleep at all because I was far too excited so I spent the early hours of the morning reading my Bradley Wiggins book I'd bought earlier that week. Bradley Wiggins was the guy who won the Tour de France this year. Friday I made all my drinks/feeds and we picked up some last minute things we needed from the shops. I had already packed my bags with everything I needed a few days before because I knew I could get the call up anytime and I wanted to be ready. My sleep Friday night wasn't much better than the night before. I was still far too excited to sleep so again I was up in the early hours of Saturday morning reading my Bradley Wiggins book knowing it was only a matter of hours before I'd be swimming the English Channel! After getting to the boat at 4am and speaking with Mike, he decided it would probably be best if we pushed our start time back to around 6.30am. This gave us time to head back to the Varne Ridge for about an hour's more sleep before driving back down to the boat. After getting some last minute advice from Mike, I put my suit on and started greasing up. We got to the start line around 6.30am and Mike said be careful when you jump there is only about a meter of water under you. Not wanting to dive too deep I did a kind of retarded side roll into the water then swam to the beach about 50 metres away. I did a few arm swings, a last minute pee and then stuck my arms in the air to let Mike know I was ready to start. I got the count down from my crew, then once I heard the horn I ran into the water and started swimming. I can't really remember too much more from the start of the swim . I was kind of having an out of body experience. I just remember thinking this is the coolest thing ever, I'm swimming the English Channel! I was feeding every 20 minutes and my crew was constantly communicating with me the whole way via a white board and pen. After the first hour I was told by my crew I was 3 minutes under the record. I couldn't believe I was that far under after only an hour. I felt very comfortable so decided to pick up the pace. This whole time my crew was writing me motivational comments on the white board and letting me know some messages my parents and friends were sending me on twitter from back home. When I took my 3 hour feed my crew let me know I was now 7 minutes under the record! They kept reminding me to relax, stay strong and keep in rhythm. At the 4 hour 30 minute mark I was told I still had 7 minutes up on the record and I was holding the same pace Petar had. This was great -while I wasn't gaining any more distance I wasn't losing any either. This is where I started to fall apart. After 5 hours I was struggling mentally and physically was starting to really hurt. I was getting annoyed and distracted at every little thing. I could feel myself slowing down and there was nothing I could do about it. My crew could see I was going through a rough patch and they tried to help, but all I did was get more angry and I even yelled at them a couple of times - which I'm very embarrassed and ashamed of now. I'd been swimming as fast as I could for 5 hours and now I had lost it mentally and was trying as hard as I could to hold it together. I think there were two things that happened around the same time that helped me through this hole I was in. The first was my crew had let me know Petar Stoychev was on the phone to Mike my pilot. He was checking how I was going... 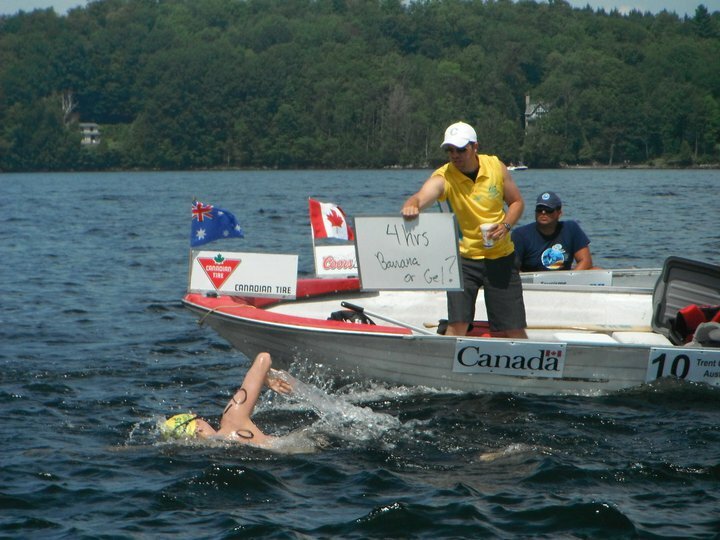 The second thing was that my crew had held up a sign letting me know I only had 4.4kms left to swim in under one hour ten minutes if I still wanted the record. My next sign said I had 2.7kms to swim in under 44 minutes. With about 35 minutes left to swim I told Damian, my support swimmer I wanted him in with me. Just after Damian jumped in I got another sign saying I had 1500m to swim in 30 minutes. I was in a world of pain by this stage. My stroke had gone out the back door well and truly by this stage and I was just throwing my arms over as fast as I could. The next sign said 500m to swim in under 10 minutes. It wasn't until this sign that I knew the record would well and truly be mine. As I got to about 10 meters from the French coast I started lifting my head to look for a good rock to climb up on. The clock doesn't stop until you are standing up on both feet stably. When I found my rock I grabbed it and pulled my body up. It was so hard to get my feet up because it was a little slippery and really sharp. I have quite a few cuts and bruises on my feet, legs, elbows and hands because of it, but when I finally got up I stuck both hands in the air to let my boat know to stop the clock. After I did this I heard a loud horn and I knew I had finished. I didn't really know what to do after this. I didn't know what to think or feel so I just sat down on my rock and stared into space for a few minutes. I was having another out of body experience. Damian was there trying to talk to me but I couldn't hear a word he was saying. I just sat there wondering how I should be feeling. When we finally got back to the boat everyone was congratulating me but again I wasn't taking anything in anyone was saying to me. My offical time was 6 hours 55 minutes flat. The boat ride back to England seemed to take forever and I was getting really boat sick. At one stage I had my head between my legs but I ended up being alright. When we pulled up at the dock in Dover I thanked Mike again and he gave us a copy of the course we took. There was one journalist there waiting for us and after the quick interview we were all in the car on our way back to the Varne Ridge. Once we got back to the Varne Ridge David and Evelyn were there waiting with a heap of the other swimmers with champagne for us. It was awesome. A couple of days before David told me if I did break the record he'd put my plaque in the prime position just above the office. When we got back there was a piece of paper over the old plaque that was there saying 'Trent Grimsey World Record holder - 6.55' ! It was unreal! Again I was still having a bit of an out of body experience, so I can't really remember too much more from then. I was up all that night with interviews and reading all the tweets, emails and support I had received from everyone. I've been having interviews from Saturday afternoon to right up till now, it's been every tiring but I've loved every minute of it. 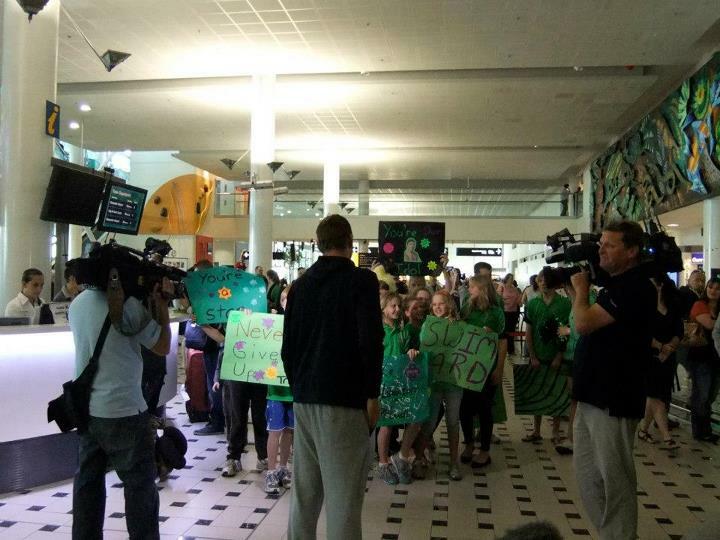 I returned back to Australia early Wednesday morning to about 30 or 40 little kids and their parents from my swimming club and lots of family all cheering for me at the airport!!! Mike Oram giving me a mouth full when I started to fall off the pace! I have so much respect for my pilot Mike Oram he definitely lived up to his reputation of being the best pilot. My crew which consisted of Harley Connolly, Damian Blaum, Donal Buckley and Owen O'Keefe were absolutely awesome and I couldn't have done it with out all of them. I would like to thank all my sponsors for the support they have shown in me this year: FINIS, Straphine Physio & Sportscare, Premax, The College of Health and Fitness, Genesis Fitness, Belgravia Leisure, Juice Plus. Swimming the English Channel is a very expensive thing to do so I need to say special thanks to BWO Group and 1Vigor for their financial assistance they gave me with my crossing! Now I'm back in Australia I will be having a two week break before starting my training up again. It's going to be awesome to just be a normal person again and relax. I plan on spending most of my time in bed sleeping and watching TV! Trent, I'd like to thank you, Harley and Damien again for the opportunity for Owen & I to be there to witness the birth of a Channel Legend and to "welcome you to the club",as we Channel swimmers call it. It was a privilege. Your swimming was aweswome, on my best day, at my fastest, I'm no-where near as good as you at your supposed worst, and to honest, your stroke didn't vary much at all. Nor have you anything to be ashamed about, you were the model of swimming decorum, and you never came up with any excuses or moaning, as you-know-who said you would. I hope you've rewatched that certain video! Also, reviewing my notes and photos, and starting writing myself, I am now convinced you can go 10 to 20 mins faster across the Channel. I doubt anyone will agree, but I think I can put a strong case for it, will do so in email to you next week. I've started writing my own spectator report, I'll let you know when it's done. Thanks and well done again Channel Swimmer!